I loved reading of alien worlds, civilizations, and ability to explore phenomena far away. "I loved reading of alien worlds, civilizations, and ability to explore phenomena far away," Joel says. "I loved advanced technology. So what really got me into astronomy was a desire to understand how the universe works, rather than simply speculate through fiction." 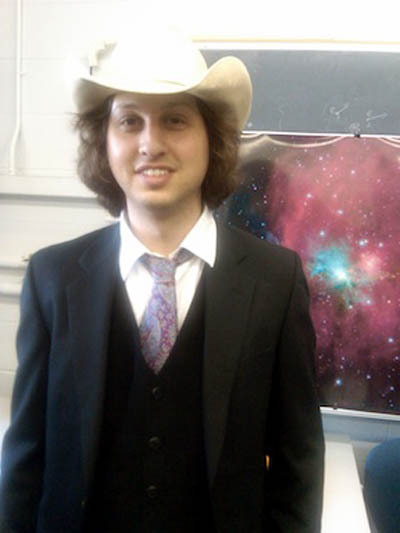 Now, as a research associate at The University of Texas at Austin, he is leading a project to observe dramatic flaring events in protostars. He is also involved in projects that use state-of-the-art space telescopes like Spitzer Space Telescope and the Herschel Space Observatory. When Joel is observing at the telescope overnight, he says, "I couldn't fall asleep if I wanted to, as observing with great telescopes is a very tenuous process; one never knows when something will go wrong! ... [Most people] do not know how crucial good weather, low lighting, and low humidity are to successful observing." Joel is an avid barbecuer. He co-founded and plays on the UT Astronomy Department's intramural softball team "The Ultra-Deep Fielders." He is also a musician. He starting playing as a child, and can play oboe, clarinet, saxophone, and English horn. Even though astronomy takes up much of his time, he says that, "I still manage to play two or three concerts every year in Austin, as part of community groups or assisting local high school groups for premiere concerts."